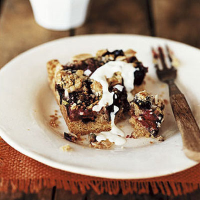 This crumbly, fruity treat is something to look forward to after a long walk on Saturday afternoon. Make the day before and transport in its tin. Preheat the oven to 200°C, gas mark 6. Line a shallow tin measuring 25cm x 18cm with baking parchment. Place the flour in a food processor and whizz with the lemon zest and butter. Add the sugar and ground almonds and blend until the mixture is crumbly. Alternatively, rub the butter into the flour with your fingers until it resembles breadcrumbs, then stir in the lemon zest, sugar and ground almonds. Reserve 175g of this mixture and set aside for the streusel topping. Add the egg to the remainder and, using a round-bladed knife, mix to a smooth, quite sticky dough. Line the base of the prepared tin with the dough, pressing it down with the back of a spoon. Sprinkle the raspberries and blueberries over the base. Stir the chopped pistachios and flaked almonds into the reserved streusel mixture and sprinkle on top of the fruits, pressing down gently. Bake for 30 minutes until golden. If the topping starts to brown too much, cover with foil. Allow to cool completely in the tin. Cut into squares and serve drizzled with single cream. Use any soft seasonal fruit, such as ripe, juicy peach, nectarine or apricot. Chop into cubes and sprinkle over the base as above and, if you prefer, leave out the nuts.